Critically acclaimed trio The Stray Birds will embark on a fall U.S. tour in support of their second full-length album, Best Medicine, beginning September 18, in Nashville at the Americana Music Festival and Conference. Out October 21 on Yep Roc Records, the band make stops in Philadelphia, Duluth, Boston, and New York City, among others – full list of dates below. 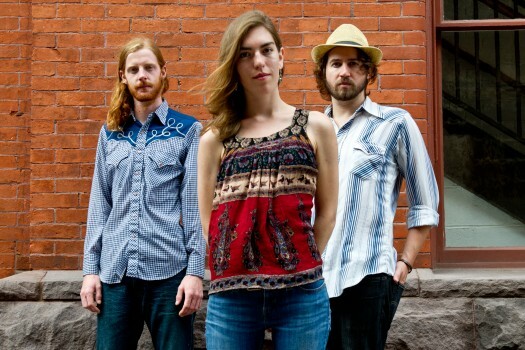 Formed in Lancaster, PA in 2010, The Stray Birds, whose “playing is gorgeous, the harmonies exquisite” (WXPN The Key), consists of Maya de Vitry (vocals, guitar, banjo, fiddle, piano), Oliver Craven (vocals, guitar, resonator, fiddle), and Charles Muench (vocals, bass, banjo). All classically trained and roots music-raised, the trio has spent the last several years honing their sound and touring extensively, including live performances on NPR’s Mountain Stage, Philadelphia Folk Festival, Kerrville Folk Festival and Falcon Ridge Folk Festival. Their Borderland EP was released in 2010, followed by the eponymous full-length debut The Stray Birds in 2012 and the Echo Sessions EP in 2013.